This is a reproduction of the mounting screw use to install rear view mirrors. Reproduction of the original black inner mirror boot which applies directly over the mirror bracket for 1968-69 Camaro and Firebird models. Each boot is an exact reproduction of the original. Reproduction of the original black inner mirror boot which applies directly over the mirror bracket for 1967 Camaro and Firebird models. Each boot is an exact reproduction of the original. 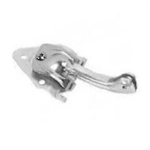 Reproduction of the original chrome inner mirror bracket. Each mirror bracket is triple chrome plated with correct mounting holes for easy installation. Reproduction of the original chrome inner mirror bracket used on 1967 Camaro and Firebird convertibles. Each mirror bracket is triple chrome plated with correct mounting holes for easy installation. Reproduction of the original chrome inner mirror bracket used on 1968-69 Camaro and Firebird convertibles. Each mirror bracket is triple chrome plated with correct mounting holes for easy installation. 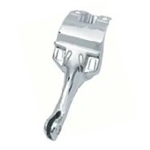 Reproduction of the original chrome inner mirror bracket used on all 1967 Camaro and Firebird models. Each mirror bracket is triple chrome plated with correct mounting holes for easy installation. Reproduction of the original 10" chrome backed rear view mirror used on all 1969 Camaro and Firebird models. Each mirror is reproduced to exact specifications including a bright mirrored chrome casing. Also includes correct Guide lettering. Note: Due to the possible glare factor from oncoming traffic and current legislation, this mirror is sold for off road use or show purposes only. For street use, the rear portion of the mirror casing can be painted black or any desired color. Reproduction of the original 8" chrome backed rear view mirror. Each mirror is reproduced to exact specifications including a bright mirrored chrome casing. 1967 Camaro and Firebird coupe rear view mirror kit. Includes - 8" mirror, bracket, screw and boot. 1969 Camaro and Firebird coupe rear view mirror kit. Includes - 10" mirror, bracket, screw and boot. 1968 Camaro and Firebird coupe rear view mirror kit. Includes - 10" mirror, bracket, screw and boot.